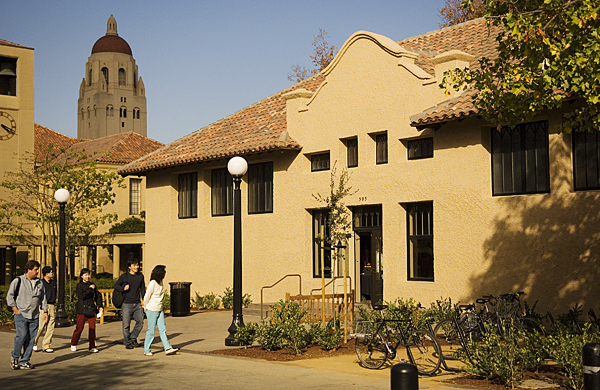 The Barnum Family Center for School and Community Partnerships is located on the Stanford University campus between the Stanford Bookstore and the clock tower on Lasuen Mall. For this project, Peoples Associates provided the structural design for the seismic reinforcement and renovation of two unreinforced masonry buildings—built circa 1900—the former campus bookstore and Sticky Wilson’s, a candy store. A fire-damaged addition built in 1984 was torn down and replaced with a new two-story structure and two courtyards. The new building has a sloped roof, stucco exterior, exterior stair, and a trellis on the east side of the building. The structure is wood framed with manufactured wood roof trusses, wood floor joists, and wood shear walls. The new Barnum Center houses the School of Education’s John W. Gardner Center for Youth and Their Communities and the Center for Research on Teacher Education and School Reform. The old candy store became a seminar room that serves both centers.